April 6, 2016 – The City of Roseville celebrated a traditional “Topping Off Ceremony” for the new 4-story office building across from City Hall. 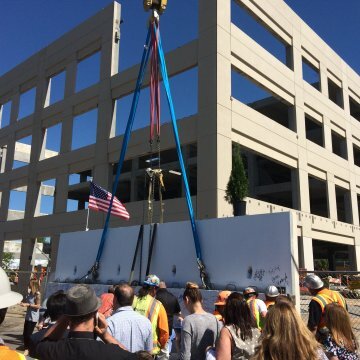 A crane lifted and placed the last precast beam of the building structure, which just prior to lifting was autographed by the attendees of the event. DPR Construction opened the ceremony with a few facts and figures about the new building. Mayor Carol Garcia shared a few kind words, after which ceremonial bottles of locally brewed Monks beer with custom “316 Vernon” labels were offered as take home gifts to the attendees (no bottles were opened on project site). The soon to be completed office building is a result of DPR’s close and diligent collaboration with the City, the design team and all of the subcontractors to keep this project on schedule. The precast building is one of the first of its kind in this area and resulted from the brilliant structural design by Buehler & Buehler Structural Engineers, Inc. in combination with the project architect LPAS, Clark Pacific, and a team of consultants. ENGEO was proud to support the team in providing geotechnical engineering and materials testing and observation services during construction.